Every year, more than 46 million turkeys are killed for Thanksgiving holiday dinners, but it doesn’t have to be this way. If you think these birds are as incredible as we do, you can join talk show host and animal advocate Ellen DeGeneres, Farm Sanctuary’s 2010 Adopt-A-Turkey Project spokesperson, in starting a new tradition this year by adopting a turkey instead of eating. 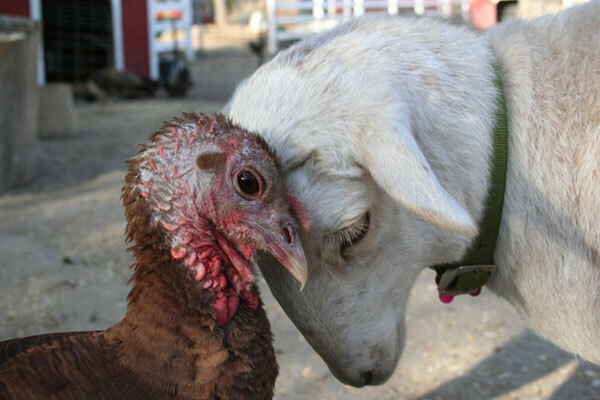 Visit adoptaturkey.org for details or call the Turkey Adoption Hotline at 1-888-SPONSOR. To learn more about these fascinating birds, be sure to check out the new Turkey Talk episode of Farm Sanctuary’s Reel Life at Farm Sanctuary video series. In this short, entertaining video, National Shelter Director Susie Coston introduces viewers to some special birds in the organization’s New York Shelter flock and talks a whole lot of turkey!